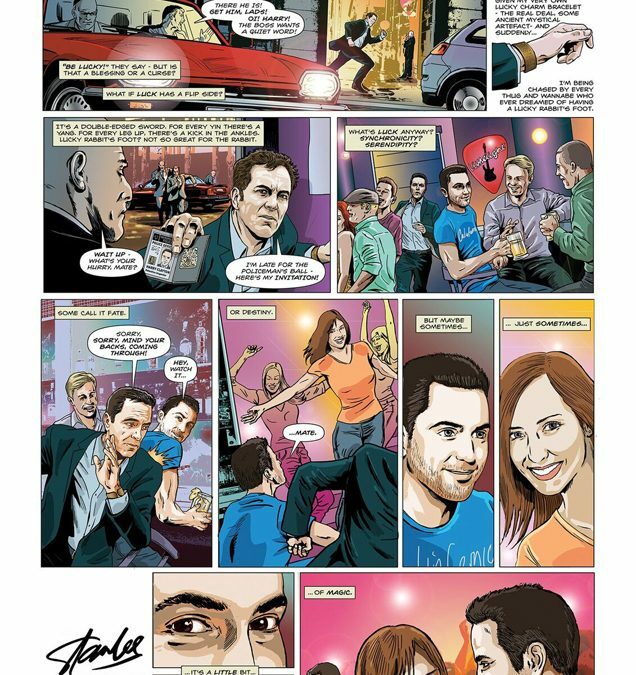 As a promotion for the TV show Stan Lee’s Lucky Man, SKY ran a competition asking viewers to submit their luckiest moments, the winner to have their “lucky moment” immortalized as a comic book page, signed by Stan the Man himself. The winners, Gary and Jenny, told the story of how they met at a club and are still together 10 years later. To tie it in with the show, and the theme of “luck”, I took the liberty of making their meeting come about as a result of something that Harry Clayton, the protagonist in the show, does – keeping the details of how the happy couple met the same, but for that minor tweak. I got to collaborate with Stan Lee! Somewhere, lost in the mists of time, my eight year olds head exploded.